SOUL & SORCERY - CHARLES R. SAUNDERS "IMARO"
I recently had a chance to discuss 'bad fantasy novels' with a friend and he mentioned that he was interested in the Soul & Sorcery genre of fantasy, something I had no idea even existed. Soul & Sorcery is a genre of Sword & Sorcery pulp fiction written by black authors starting in the late 1970's as an alternative to "Western" Fantasy with it's use of Celtic, Norse and Arthurian mythology as world-building tools, and also as a way to counter some of the retrograde racial attitudes and depictions found in Sword's & Sorcery - like those in Conan (which was written mostly in the eugenics obsessed 1930's). Soul & Sorcery, or at least the Imaro stories I read, doesn't really feel, or perhaps it shouldn't really feel, like a genre of it's own - it's simply a Sword & Sorcery tale set in a mythical Africa, rather then a mythical Europe. Soul & Sorcery is an interesting sub-genre of fantasy in that it is both very different from standard Sword & Sorcery and very much the same. I picked up "Imaro" by Charles R. Saunders - a collection of the first Imaro stories available for kindle and fairly cheap. Imaro seems to have been the birth of the genre, with the first Imaro story published in 1975. Imaro the character and the stories involving him are very much a homage, reworking or retelling of Conan stories. The title hero, Imaro, is in the Conan mold - "massively thewed" and a dangerous fighter with a somewhat gloomy outlook and tendency towards anger. 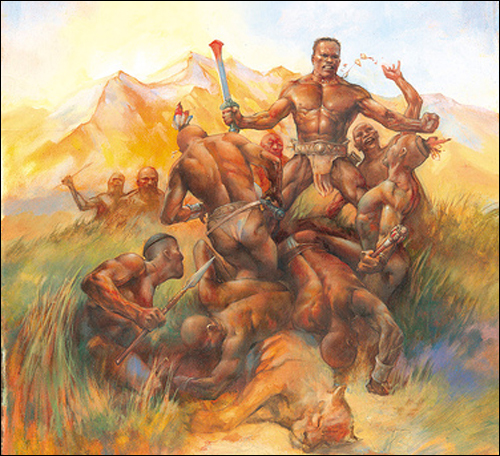 Imaro battles sorcerers, their necromantic creations and dangerous animals, but the savannahs and jungles he wanders are very different then Conan's forests and icy plains. Saunders has taken effort to make Imaro's world distinctly African, and this provides the interest in what would otherwise be fairly formulaic (though quite readable) Swords & Sorcery stories. Imaro represents a "reskinning" (perhaps that's not the best term here) of Howard and his imitators that is pretty charming because it is different. I also suspect Imaro is as light on historical/mythological fidelity to it's East African source material as Conan is to it's Northern European, but that's likely for the best given that Imaro is a straightforward set of stories about triumphing over evil wizards. Imaro is set entirely in a fictitious fantasy Africa, about as closely linked to the real world as Howard's fictionalized Fantasy Europe/Hyboria, where the hero begins in a fictional Southern or Eastern African (seemingly a fictionalized fantasy Masai/Bantu/Zulu) and moves Northward though various African biomes and broadly sketched fantasy version of historical African cultures. It is interesting to compare Saunder's fantasy Africa to Burrough's fantasy Africa, and note how much more alive Saunders' feels. Burroughs' Africa is a set-piece jungle and occasional set-piece savannah inhabited by cookie cutter 'savages' of the noble and good or cannibal and evil variety. Ignoring how these stereotypical depictions are a mark of the era of Burroughs writing and how this aspect of the Tarzan stories might be off-putting to modern readers, I think there's a useful lesson about world building here. Saunders clearly had more knowledge about Africa the place and historical African peoples then Burroughs did, and it shows to his advantage in depicting a fantastic version of the place (or part of it - part of Burroughs problem is imagining an 'Africa' that is a single jungle filled expanse rather then a huge continent). Now I'm not suggesting that Imaro can be looked at for any historical facts, any more then Conan will tell you about the Celts, but having taken the time to look at the technology and culture of the ancient peoples he is modelling his fantasy on, Saunders can add context and details that makes sense - the savannah folks are nomadic hunters and herders who live in easy to transport hide domes and value cattle greatly while the jungle people live mostly by fishing and gardening along the riverbanks and reside in conical houses of clay and thatch. These details, seemingly pulled from historical sources, make sense and so can be readily understood without having to remember a great deal of fantastic vocabulary or world specific oddness. They are also details, and so give the reader a better understanding of Saunders' world building then Burroughs endless villages of huts built around a giant cooking pot. 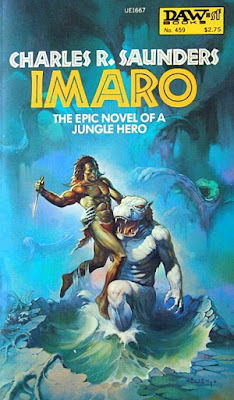 What's interesting to me is that Imaro manages to tell the story of a mighty outcast warrior traveling from adventure to adventure, without becoming too trite. Imaro is a light African veneer over a very Hyboria fantasy world, but because it has different, readily comprehensible details it's very readable and feels fresh despite the cliched story. A fantasy game can do this as well, and I think avoid being 'cultural appropriation' or at least avoid 'bad cultural appropriation' if it takes some other ques from Saunders. This isn't a huge concern of mine, but I think it's worthwhile to aim for both evocative settings that avoid cliche and stereotype. The Africa of Imaro is simply it's character's world, and while it contains many elements pulled from historical sources these don't ever create the impression that Imaro is trying to make a historical comment or explain anything about Africans or Africa's past. That is to say that the historical elements in Imaro (what few there are) aren't presented as something strange and exotic for the reader and main character to see as a stand in for strange or alien and unfathomable when compared to the reader and viewpoint character's basically modern worldview and values. The quasi-historical elements in Imaru (and in a good reskinning I think) are used to explain the fantasy cultures that have them and build up a comprehensible and consistent fantasy world rather then as a shorthand for some quality of strangeness or stereotypical values that the author is too lazy to explain. Unlike Dragonlance's blonde pseudo-Sioux Que Shu, Imaro's pseudo-Africans don't simply have the outward appearance of a real culture as a stand in for "barbarian", which is the real issue about cultural appropriation and setting design. I say real issue not out a strong political stance (though that as well) for non-racist game settings (really why bring the ugly of the real world into a space where you can have the ugly of invading demon armies?) but because it's lazy. Even if a creator happens to have different politics then mine (and there are plenty who do) using the outward trappings of real world cultures as a stand in for 'strangeness','barbarism' or somesuch in one's game is lazy and will result in a more boring game world then actually looking at the historical culture one is modelling one's fantasy people after. The point I want to make here is that the world of Imaro works and feels different from standard fantasy because it starts at a different source, even if the story the book tells is completely standard. Saunders seems to have realized that by using Africa as a basis for his work he had a great deal of little touched potential fantasy material - a wondrous geography, an ecosystem of animals that are practically already fantasy monsters and a wealth of history, folklore, myth and culture to plunder for interesting stories, situations and fantasy elements. I think this can be easily done for a tabletop game as well, and reading Imaro made me resolve to grab a copy of Spears of the Dawn which seems to follow the lead of Imaro and other Soul & Sorcery stories in its world-building. Imaro separates itself from Swords & Sorcery by focusing on it's African elements, but at it's heart it's the same journey through mythic landscapes and overcoming strange men, beasts and sorcery that is the basis of the Conan stories and of most Swords & Sorcery. The hyper competent man alone against a strange world is a great storyline, but it's also become pretty cliched, especially in the fantasy context. What keeps Imaro interesting is the different gloss on the fantasy world. It's still as approachable as Tolkien or Howard's fantasy world, but the differences are in the tone and adjectives. I think there is a lesson in Imaro on how a tabletop creator can avoid simple retread of D&D Fantasy, itself an attempt to rationalize the worlds of Tolkien, Howard, Vance and Burroughs, by simply looking into historical sources that aren't the sources of standard European fantasy stories and finding inspiration. I'd read Imaro, looks good. Though I'm a lurker in that I almost never comment I want to say I really enjoy your blog! Your art is detailed, grimy and fun. Not an easy combination to hit upon. That said, I want to thank your for putting the Imaro books back on my radar. I've read Howard's Conan and look forward to seeing what scenes Saunders paint of an Afro-Hyboria. I dream of using my copy of Spears of the Dawn to run a campaign. Perhaps someday I'll harass my group into participating. @Whitney - Glad you like the blog! I think I've seen your comments before so it's nice to know I have longtime readers. If you do ever run Spears of the Dawn let me know how it goes? You know if your looking for fantasy Africa I've heard "Nyambe" is good. I haven't read it myself though, so I cant personally vouch for it. Spears of the Dawn is a perfect fit and a darn fine game. I'm trying to use Spears of the Dawn, and some D&D creatures, to help me make an African Warhammer setting. Now I have this to reference. Thank you!